Even by the end of the century climate changes can by a principal way influence forty per cent of the world ecosystems. This is stated in a common study of NASA and The California Institute of Technology. Bits of Science server has informed about the results of the scientists. Climate changes will lead, in the opinion of the scientists, to extensive transformations of forests, steppes, tundras, deserts or glaciation occurence. Even there where there is no desert or on the contrary ice, a transformation of 30 per cent of vegetation is expected. Among areas where the climate change will be the most significant there belong vast areas on the northern hemisphere: most of Europe and Siberia, the north of the USA and Canada, the north of China and the area of the Himalayas. The model is based on the assumption of a global average temperatures rise of two to four degrees Celsius by the end of the century. If this prediction comes true, the temperatures will reach the level of maximums from interglacials. But this time the temperatures rise is going on about one hundred times faster than during the alternation of ice ages and interglacials. The fast change shortens time for a possible accomodation of plants and animals and on the contrary increases a risk of their extinction. “We have obtained another warning signal. The study shows that Europe belongs to the most endangered areas. All countries in Europe should therefore greatly increase the costs not only for the fight against climate changes but also for adaptation measures which would help endangered species of plants and animals survive. 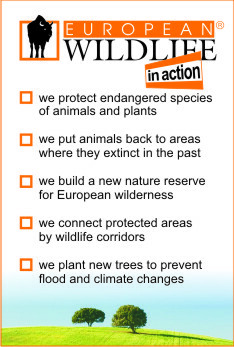 Exactly in this field European countries do desperately little so far,“ stated Dalibor Dostal, the director of European Wildlife conservation organisation.